8 May 2017, at 12:01a.m. US - US pork and beef exports capped a strong first quarter with excellent March results that included a new record volume for pork, according to statistics released by USDA and compiled by USMEF. 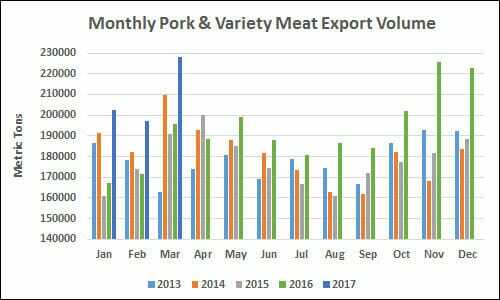 Pork exports reached 227,955 metric tons (mt) in March, up 16 per cent year-over-year and topping the previous monthly high set in November 2016. Export value was $586.6 million, up 22 per cent. For the first quarter, pork exports were up 17 per cent in volume (627,647 mt) and 22 per cent in value ($1.58 billion). March exports accounted for 28 per cent of total pork production and 23.3 per cent for muscle cuts only, up from 25.4 per cent and 22 per cent, respectively, last year. First-quarter ratios were also significantly higher at 27.2 per cent and 22.6 per cent, compared to 23.9 per cent and 20 per cent in 2016. Export value per hog slaughtered averaged $54.93 in March, up 15 per cent year-over-year, while the first-quarter average increased 18 per cent to $52.42. The red-hot pace for US pork exports to Mexico continued in March, with volume up 34 per cent year-over-year to 68,866 mt, and value increasing 47 per cent to $127.2 million. For the first quarter, exports to Mexico totaled 206,262 mt (up 29 per cent) valued at $371.9 million (up 42 per cent). Strong demand from Mexico is especially important for US ham prices, but pork variety meat exports to Mexico also posted a strong first quarter, increasing 14 per cent in volume (37,596 mt) and 38 per cent in value ($58.1 million). In leading value market Japan, March exports increased modestly in volume (37,806 mt, up 2 per cent) but climbed 12 per cent in value to $155.2 million – the highest since October 2014. In the first quarter, export volume to Japan was up 7 per cent in volume (101,581 mt) and 13 per cent in value ($411.3 million). Chilled pork exports to Japan increased 3 per cent to 56,307 metric tons, while value increased 10 per cent to $260 million. Strong variety meat demand in China/Hong Kong helped drive exports to the region 5 per cent higher in volume (131,036 mt) and 11 per cent higher in value ($258.8 million). While muscle cut exports slowed, variety meat volume climbed 24 per cent (to 86,097 mt) while value was up 29 per cent to $176.2 million – making an important contribution to per-head value. Since posting a slow start in 2016, pork exports to South Korea have steadily regained momentum as exports totaled 51,158 mt (up 31 per cent) valued at $137 million (up 39 per cent). Most US pork now enters Korea duty-free under the Korea-US Free Trade Agreement, which has helped boost volumes of raw material for further processing, as well as processed pork products. Another major market rebounding from last year’s slow start is Colombia, where US pork also benefits from lower tariffs secured in a recent free trade agreement. First quarter exports to Colombia doubled from a year ago in both volume (16,532 mt) and value ($36.5 million). Also bolstered by a near-doubling of exports to Chile and Peru, first-quarter pork exports to South America were up 95 per cent in volume (23,838 mt) and 94 per cent in value ($57 million). In Australia, an important market for US hams and other cuts utilized in further processing, exports increased 38 per cent in volume to 20,607 mt, while export value climbed 43 per cent to $57.7 million.